Baking Partners # 6: This month we had been challenged to make pies.We had a total of four recipes both sweet & savory recipes.The recipes were suggested by Tamy @ 3sides of crazy,Gayathri@ Gayathri's Cook Spot, Samantha @ Samantha Menzies.I selected the apple pie recipe suggested by Gayathri@ Gayathri's Cook Spot,suggested from taste.com.Thanx Gayathri for the lovely recipe.I have made a slight change in the recipe by skipping the egg in the crust and added only egg white for the final brushing.As I was baking pies from scratch for the first time ,so took the simplest one to prepare.The second reason of selecting this was that my kids loved sweet pies so I knew savory ones wouldn't be preferred much;though I like savories.Will try out the other ones sometime later.This pie has a puff pastry kind flaky crust and the apples are tender and juicy with the flavors of cinnamon.We all just loved each bite of the pie.Do give this a try and you'll definitely fall in love with this pie,a great way especially for kids to sneak in apples too !!! Sift the flours together ,add salt in a large mixing bowl.Add the cubed pieces of chilled butter and rub lightly into flour with your fingertips.Lift mixture high above the bowl as you rub, to incorporate air into the pastry and make it lighter. Continue until mixture resembles fine breadcrumbs, then stir through sugar. Add the chilled water, then drizzle over flour mixture. Start to bring the dough together by cutting the liquid into the dough with a blunt knife.Place it over the counter top and bring the dough together to form a ball with your hands, adding a little more water if necessary.There will be chunks of butter seen here & there but that's quite normal.Divide dough into two pieces, one slightly larger than the other.Flatten the balls in disc shapes of 5" diameter,wrap in plastic wrap and chill for 30 minutes. To make the filling, peel and core the apples, and cut each into eight to ten pieces. Toss immediately with lemon juice in a large bowl, to prevent apples from discoloring. Place the butter and sugar in a large non stick pan over medium-low heat.When butter has melted, add apples and spices, then stir to coat. Cook, stirring occasionally, for 10 minutes or until apples have softened and the sauce is thickened Set aside to cool. Roll out the larger pastry ball on a floured counter top to a 30 cm circle (about 2mm thick). Roll pastry around rolling pin,brush off any excess flour beneath.Then unroll over a 22 cm(8 3/4" pan) metal pie dish/aluminium foil tray.Gently press into corners and trim off the excess from the sides using a sharp knife.Beat the egg white with milk, brushing some on rim of the base. Place filling in base with a slotted spoon.Roll the small pastry piece to a 25 cm circle.Top it over the filling,covering fully,tuck in the excess sides under the base sides. Crimp edges of pastry together with your fingers or make indentation using your knuckles to give a good pattern at the sides or else use a fork.Brush the remaining egg white on top and rim.Chill for 30 minutes. Preheat oven to 180°C, place pie dish on a baking tray. Brush top of pie with more beaten egg, sprinkle with caster sugar. (I haven't sprinkled the caster sugar on top) Cut four-five small air vents in the center of the pie and bake for 45 minutes or until golden brown.Mine was done at 48 minutes.Cool on wire rack and leave to cool for 2-3 hours so that the sauces thickens and is ready to cut,serve !!! * Flattening the balls in disc shapes makes it easier to roll later after chilling. * Use chilled butter always.If you're using salted butter,you can skip the pinch of salt in flour. * Use chilled water to bring the dough together. * Don't try to get a smooth dough,instead get a rough ball and refrigerate often to prevent the butter from melting.This will give a flaky crust when baking. * If you wish to bake the pie using eggs,you can mix one egg with 1 tbsp of chilled water and add to the flour. 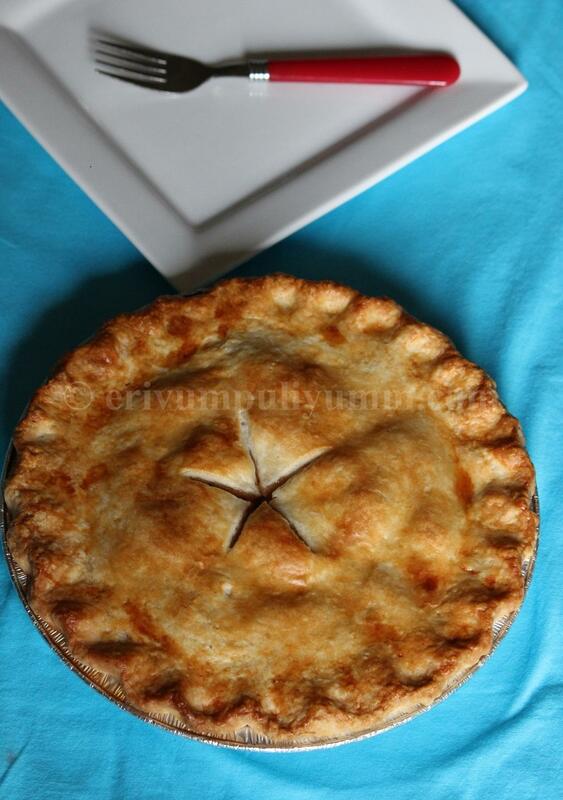 * You can store the pie at room temperature for 2-3 days. * I have taken a few tips from this video too. give me some vanilla ice cream and that slice of pie and i will thank you for it. lovely julie....u have done it so well! 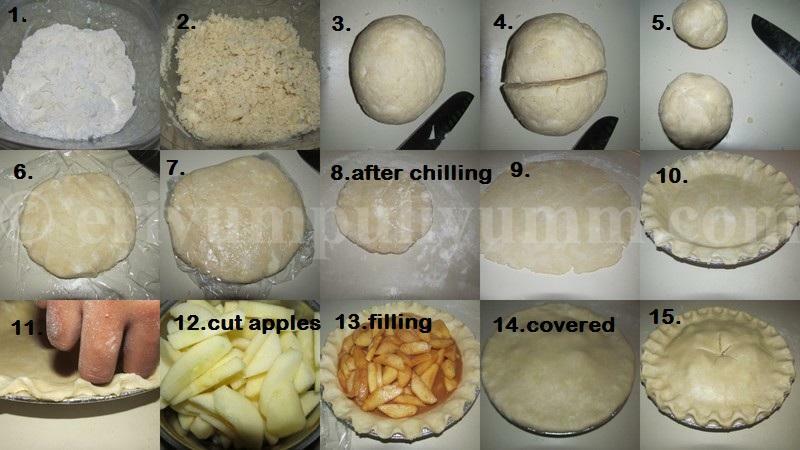 Perfect pie recipe ever. Nice stepwise pictures. Delicious and fulfilling Apple Pie. Wonderfully prepared. 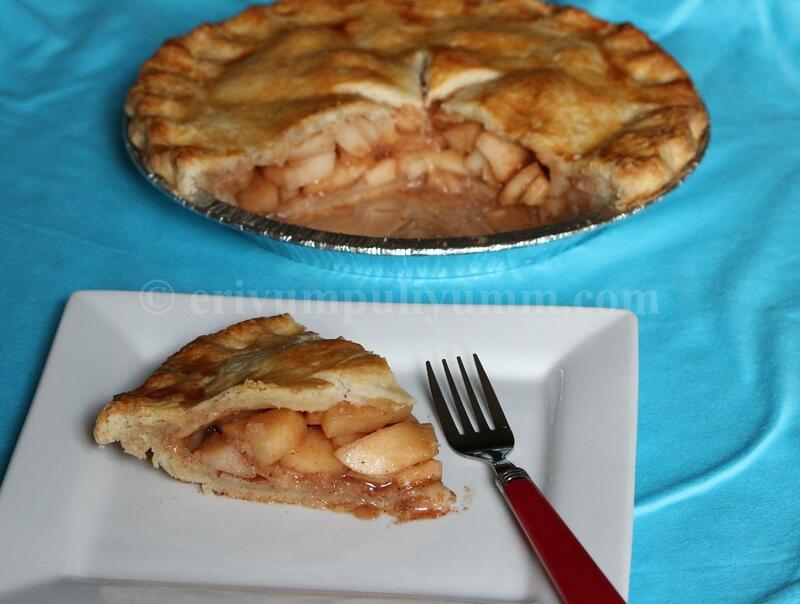 Julie, The apple pie looks amazing...I loved the flavor of cooked apples and hence love this Pie a lot...BTW, you have progressed so much with your new website. The pictures are looking also amazing. lovely apple pie dear so good. Looks awesome Julie! Love the star cut out in the middle! Looks delicious Julie. I wanted to try the savory one but my offer was cut down short. :) Loved baking this. Wow Julie..love the star cut on top of the pastry..amazing sheen. Well explained so anyone can try it. Looks awesome dear! Wow ur pie looks just like one @ bakery stalls... it is very professionally made... congrauts.. Delicious apple pie, I love your version. Try to add some chukkupodi they make really awesome taste. Nice apple pie.Love the pitures. 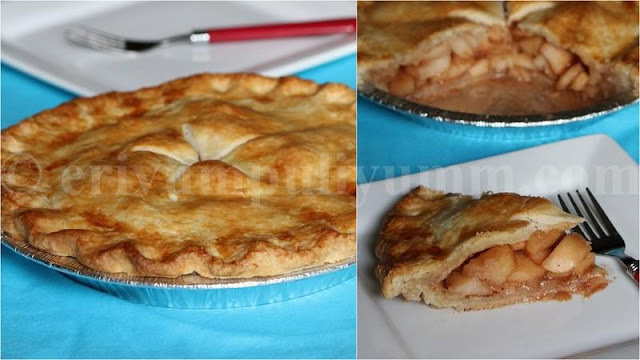 Though am not abib fan of pies, this looks awesome..
Nice detailed explanation with pics...Apple pie looks awesome.. Such a beautiful,neat and droolworthy apple pie, love the way you pressed the edges,fantastic. Awesome. Love the version. Must try. Perfectly made Pie, looks delicious. Woow, Amazing effort and love your pictorial..Great job dear..
Beautiful pie!! Those notes are really helpful! wonderful pie, looks so professional!!! what a creation..love those apples and the golden,flaky crust. Hi Julie, thanks for dropping by my site again. I've never made this type of pie and I like it very much. Cheers from Spain. Beautiful pie, Julie! Love how perfect the crust looks! That is an incredible looking pie...kudos!! Beautiful beautiful pie, Julie. This one shows how perfect you are with your kitchen outputs. Loved it.